I always enjoy when one of my favorite reads is released in audiobook format. I appreciate “rereading” the book in the more dynamic format, especially if the narrator helps bring the emotion and characters to life. 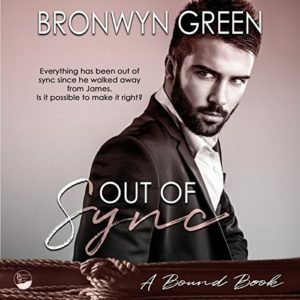 This is true of Out of Sync by Bronwyn Green. Once a promising musician, Morgan Weaver walked away from what he loved to fulfill his father’s expectations. Now he’s stuck in a job he hates, working for the family business, spending little time outside the office. He hasn’t composed or played music in years, not since he walked away from his dreams, and the man he loved. James (Jamie) Shepherd continued playing music after school, creating a life doing what he loves and is now a successful musician. Once roommates, James and Morgan haven’t seen each other in over ten years. However, James remained friends with Morgan’s sister, so when he finds out that Morgan is refusing to play at her wedding, James decides to confront the man who used to be his best friend, bringing them together in all the best ways.